Elizabeth manages Your-Voice Customer Services, a company that specializes in outsourcing the customer service operations for other companies. “When you call to check an account or request service from a company you do business with, lots of times we may actually be the voice on the other end of the phone,” says Liz. 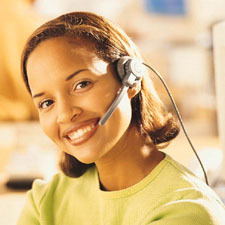 “From account services to technical support, we do it all. About the only thing we won’t handle is collections. “One of the important things we did when we set up the company was to distribute our people around the country. We don’t have a big central office with a huge call center and dozens of desk like you see on TV. Most of our people work out of their homes, using an Internet connection and our phone system. “What phone system? Well, it’s not what you might expect. We looked at putting in one of those big switching systems and decided it just wasn’t cost effective. The thing would have been obsolete about the time they got it in. Instead, we went with the Universal Office. We set up a separate Universal Office for each customer, so we can do lots of customized things. It costs us a LOT less than that big hunk of iron would have. “Now, when someone calls the ‘customer service’ number for one of the companies we work for, the Universal Office system answers the call, and says ‘Hello. Thanks for calling XYZ Company’s Customer Service office. Whose Calling?’” They say their name, and the call goes through to one of our service reps.
“We have about 50 reps right now, spread out around the country, so that we cover all the time zones from East to West. The system has a list of all their numbers, and it puts the call through to whoever is next in rotation for that company at that time of day. When the rep answers, they hear ‘So-and-so is holding for XYZ Company’. They press a button and the caller is there on the line. “While they’re doing that, they’re also on their computer, clicking on that company name and getting ready to pull up the customer’s records, using a computer program we had written for us. It gets all the information across the Internet from our headquarters office, and that database server is the ONLY centralized thing we put in. “The Universal Office will try three reps until one can take the call, so we get really good coverage. If no one can take the call, or if the customer doesn’t want to wait, the Universal Office takes a message, and that message goes straight to our email system. Each company we serve has a different phone number, and that number appears in the email header, so we made use of that. Our special computer program gets those emails and puts them into a ‘call back’ queue for that company, which appears on the reps computer screens. “Between the reports we get from the Universal Office and the reports we get from our custom application, I know just how we are doing in terms of call volume and call handling for each customer at any time. I don’t have to guess how it’s going – I KNOW. "My reps all work on a base plus commission, so knowing the call throughput is really important. But they really WANT those commissions as quickly as we can pay them, so I went to using GenieCards as well. Now I just run my weekly reports, figure how much commission goes to each rep, and shove it onto the GenieCard that goes with their Genie number. They see quick cash and I see happy clients. “I don’t want to think about how it would be without the Universal Office. I worked at another service company for a few years, and they used one of those big, centralized switching systems. It was a nightmare let me tell you. The service techs were out an average of once a week to fix something or other. I don’t have any of that hassle here, and I won’t let it in the door. I want to ANSWER customer service calls, not MAKE them.